It’s been a very busy month for me which is sad because it just so happens that one of my most awaited games has finally been released, Monster Hunter Tri. I managed to pull off some hours into gaming but I’m pretty sure it’s not enough to cover everything that’s new. Still, I think I can pull off a review with what’s what and what’s new with Monster Hunter Tri. Monster Hunter Tri is a departure from the current world of Monster Hunter games and feels like a much needed franchise reboot. The basics are ther however, you’re a hunter, the village (this time it’s the Moga village) needs you and in turn recruits you to hunt monsters for a living. Sounds familiar? Well yeah, it probably is since that’s pretty much the staple premise of all Monster Hunter games. 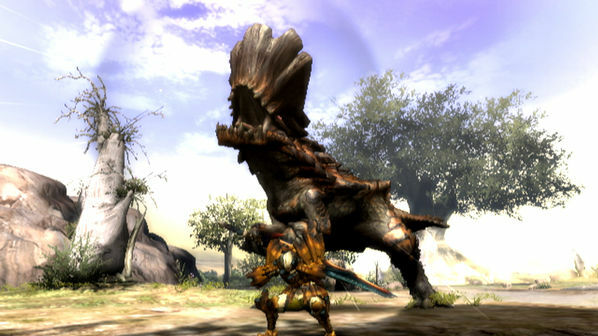 However, while it does retain a lot of the typical Monster Hunter formula, there’s a lot of NEW to it. I’m hoping these few words would do justice to the game that Capcom has given us. I have to say, I love what Capcom has done with Monster Hunter Tri’s visuals and overall environment. Sure it’s a Wii game so it’s really just SD graphics and having a component cable doesn’t really make it all better but the level of visual detail that Monster Hunter Tri has is simply incredible. 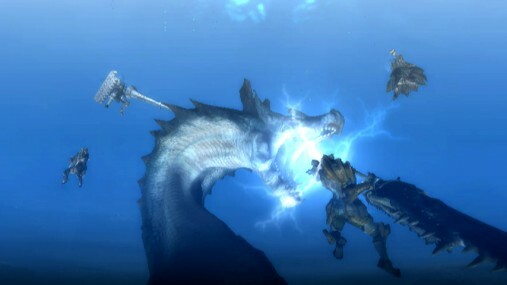 If asked as to what is the most visually impressive game on the Wii, Monster Hunter Tri takes my vote. Not only that, Capcom has managed to cram multitudes of gigas and dohickeys into the game that there’s literally so much to do. Let’s take our armor and go for a swim?!?!? The addition of underwater levels is a welcome addition to the Monster Hunter world. 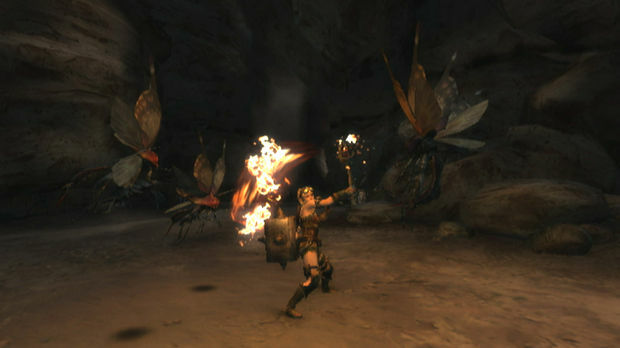 It opens up new areas for exploration as well as provides new monsters to hunt. Movement and combat is basically the same as with the land-based levels except that you have to take note of the amount of air that your character has (think of it as a time limit). Like other environments, the underwater levels host a unique set of monsters and bosses that you might find beneficial to hunt for :). I think this goes without saying that a Monster Hunter is long. I doubt you’ll spend below 20 hours on a Monster Hunter game and actually be “DONE” with it. There’s so much to do. In Tri, that all changes. Yes, the single player is probably good for roughly 30-80 hours of gameplay (depending on your skill level and if you plan on completing everything), the online multiplayer mode however adds oodles more of your time. This, I think is what Monster Hunter Tri’s black horse. Multiplayer is what made every Monster Hunter game on the PSP such a hit and will make Monster Hunter Tri a must have game for Wii gamers. Monster Hunter Tri’s multiplayer mode takes you online (there’s a local multiplayer option but that’s for two players only and it only allows play through the arena :() with three other hunters battling monsters more powerful than those available in the single-player mode. Communication is done via a Wii-compatible (any standard USB keyboard usually works) keyboard or the Wii Speak microphone. I prefer the keyboard though as it’s a cheap option (who doesn’t have a keyboard at home anyway?). Oh and did I mention that the service is free? 🙂 Yep, while the Japanese folks are enjoying the game AND paying for the online service, we get to mooch off the servers for free :). As with past monster hunters, when hunting with a party, each time a member of the group gets K.O.’ed, you lose part of the reward. Once your party has incurred 3 K.O.’s the quest ends. If you succeed however, you gain loots and what we call Hunter Points. These points in turn increase your Hunter Rank (after a certain level). And finally, Hunter Rank determines which party members you can team up with an which monsters you can hunt. The online multiplayer can also be host to special, online-exclusive events like (what else is there to do?) hunting special monsters that’s held every month. As for DLC? There are DLCs in the form of downloadable quests. Capcom Unity says it’ll be a monthly thing but there’s no word on when it’ll start. If you’ve been waiting to get a game for the Wii that’ll never leave your drive, THIS IS IT. My only qualm is that even for experienced Monster Hunter players, the game starts off as challenging. I miss the tutorial stage :(.